when her mother brought her along to yoga and meditation classes in their hometown studio in Newburyport, MA. An active runner and athlete, she rediscovered yoga after finishing college, and began taking Bikram yoga classes to heal her sore “runner’s knees”. Amazed at how yoga not only alleviated pain in the joints, but also created a freedom of expression and comfort in the mind and the body, Sarah was hooked. Keeping a daily practice for over seven years with Bikram, vinyasa, and restorative yoga, Sarah decided to take her practice a step further. 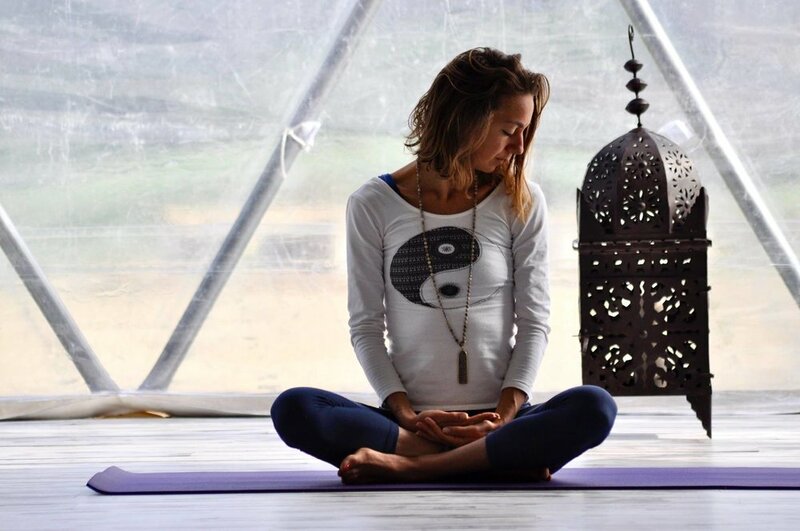 She completed her 200 hour Vinyasa Flow Teacher certification with Frog Lotus Yoga International in Bali, Indonesia in 2015, training and teaching alongside some of the best instructors in the world. She also completed her Childlight teacher training, and is certified to teach ages 2-18. Sarah is also OM births certified to teach expecting mothers. Sarah recently ventured to Bali again to complete her 300 hour YTT with Zuna Yoga, to further advance her skills and knowledge. Traveling and teaching all over the world has allowed Sarah to be constantly inspired by nature, spirituality, and the elements, linking movement, breath and life through the graceful practice. Classes combine kirtan, mantras, mudras, pranyama, and asana... deepening the full yoga experience. Her playful, energizing classes challenge the body while still relaxing the mind. Sarah encourages growth and interconnectedness of the physical and spiritual self within her students, and incorporates accessible levels and modifications for each individual. Sarah seeks to help others thrive by nurturing body and soul through yoga, and her hope is that her students will step off the mat and into everyday life with that same nourishment and balanced attitude. Whether it is your first class or your five-hundredth, Sarah will help you to build your yoga practice, and re-energize your life!